I live in Omaha where I’m able to do design work that emphasizes the importance of community stewardship, engaged neighborhoods, the arts, education, small business, and mass transit. It’s design as civic engagement. A non-profit organization that maintains unwanted vacant land to elevate the property’s utility and value for the surrounding neighborhood. They create healthy ecosystems through urban agriculture and related economic development. 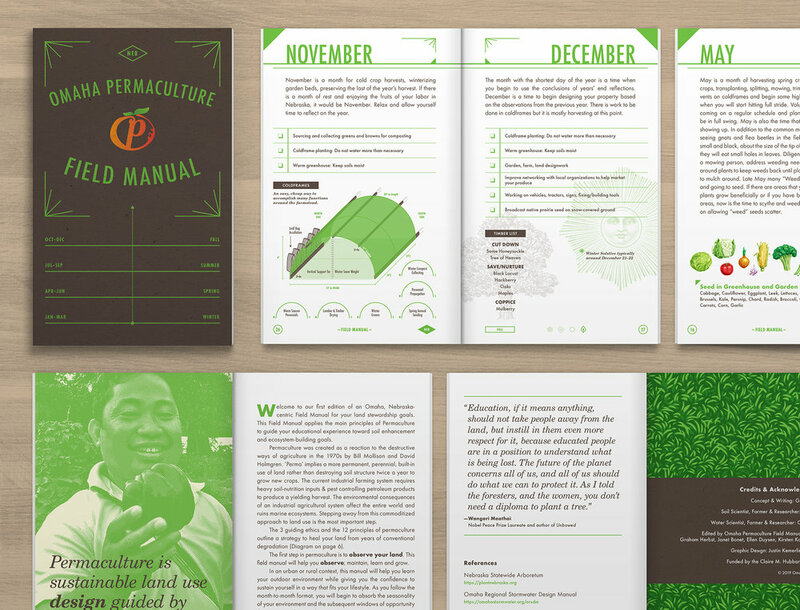 Together, we created a landscape manual for their landscaping crews. This manual is a tool for them on various sites around the city. Readable, functional, and easy to work with in the field. 12 months, 4 seasons, and all you need to know to embrace the land in this Midwestern city. 2018–2019: Print, Layout, Illustration. Iconography by Nicholas Burroughs. Founded in 2011, 75 North has one purpose: to facilitate the creation of healthy, sustainable, mixed-income communities in the Highlander neighborhood. Their goal is to break the cycle of poverty and community deterioration by building thriving schools, recreational facilities, and other amenities to attract new public and private investment to the area. Highlander is absolutely amazing. For the 75 North offices, we were asked to create a large wall mural to showcase the entire project. The final illustration was a large scene that highlighted all the important spaces and partners. An overhead view with plenty of detail and added dimension to show off the unique architecture and site planning. Vibrant density, open green spaces, and high-quality housing all come together to offer an answer to the question: how do we end poverty? At Highlander, the answer is to make the solution beautiful. 2018: Design Direction. Illustration by Matt Carlson. For nearly 60 years, this Omaha area non-profit has been dedicated to litter reduction, community beautification, and education on recycling and environmental stewardship. The new look was designed to feel like an environmental organization while visualizing to the community it’s heading in an exciting new direction. A modern logo, fresh color palette, concise stationary (printed on 100% post-consumer waste), and unified document templates were delivered as a new brand package. The logo mark puts the big ‘O’ at the center while 2 halves, the urban and the natural, come together to represent stewardship and sustainability. 2016: Branding, Logo Design. Print & Layout by Adam Casey. Public-private initiative dedicated to actively facilitating the development of neighborhoods in the City of Omaha through communication, education, and advocacy. This community campaign was designed to allow neighborhoods to feel united while asserting their own individual strength and identity. 2016: Graphic Design, Community. Collaboration with Adam Casey. Branding by Oxide Design Co. Non-profit arts organization whose mission is to build an audience for the arts in the Omaha metro and to support local artists with tools to allow them to make a living through their artistic practice. This rebranding focused on clarifying and simplifying. 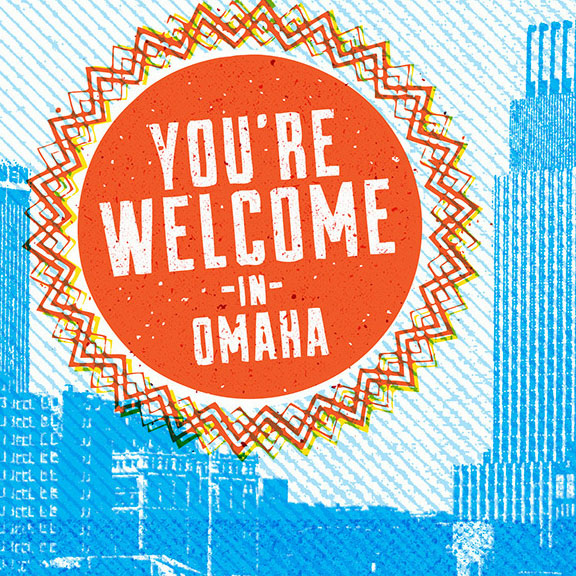 The logomark represents the Greater Omaha community, the individual at the center, and how both of those elements are connected and supported by creativity. From the established art community, connected with bright creativity, to the young emerging artist. Leadership and advocacy, engagement and inspiration. 2015: Branding, Site Design, Squarespace. Collaboration with Jake Welchert. An initiative of the Omaha Public Schools, Making Invisible Histories Visible gives students and teachers the opportunity to explore Omaha’s hidden history. Together, they create digital history projects, which OPS social studies teachers can use in their classrooms during future school years. For the project, we established a clear website architecture to be implemented into a DNN theme and provided assets to help visualize their mission. 2015: Design Direction, Site Design. Iconography by Jake Welchert. Logo design by RDQLUS. A leading source for small and micro-business development in Omaha since 1982. OSBN has helped countless small businesses startup and grow in the heart of North Omaha by providing financial support, commercial office space, professional development, and training support. 2015: Design Direction. Branding, Site Design & Development by Jake Welchert.